Analysis: While Golladay played through the issue in Week 16, he didn't do enough in the practice week to inspire confidence in his status for the regular-season finale. He'll end up sitting out a relatively meaningless game, leaving the depleted wide receiver group to be led by the likes of Andy Jones, TJ Jones and Brandon Powell. It's a tough break for any fantasy owners counting on Week 17 production, as he would have faced an already-vulnerable Green Bay secondary that is further depleted by injuries. Analysis: Golladay presumably will be listed as a limited participant for a second straight day, after starting the week with an absence Wednesday. His status now appears murky for Sunday's game in Green Bay, with another update coming once the Lions release their final injury report Friday afternoon. Analysis: One week removed from being limited all week by a chest injury, Golladay has progressed from no activity Wednesday to some Thursday. Clearly, he's trending in the right direction, but Friday's injury report will reveal whether he enters the weekend with a designation. Since Golden Tate was dealt to Philadelphia between Weeks 8 and 9, Golladay has put together an eight-game run composed of 40 catches (on 75 targets) for 586 yards and two touchdowns. Analysis: With the chest injury in tow, Golladay practiced in a limited capacity last week, so he isn't too far behind this time around, especially if he progresses to an uncapped session Thursday and/or Friday. The Lions' second Week 17 injury report will divulge his activity level as he aims to play through the discomfort for one more game. 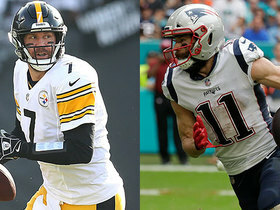 Golladay didn't practice Wednesday due to a chest injury, Michael Rothstein of ESPN.com reports. Analysis: Golladay was limited by the same issue all of last week, so his lack of participation this week may just be a precautionary measure. Only time will tell, though. The second-year wide receiver has two more chances to take part in practice before Sunday's visit to Green Bay. 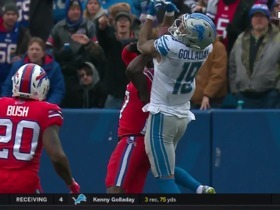 Golladay didn't take part in Wednesday's practice, Dave Birkett of the Detroit Free Press reports. Analysis: Golladay has tended to chest and quadriceps injuries during the stretch run, but those issues haven't stopped him from taking the field on gameday. Over the least seven games, he's drawn eight targets in a contest six times. 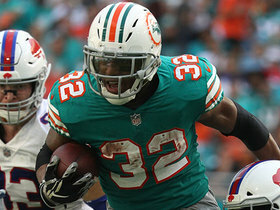 He's surpassed 100 yards twice and scored two touchdowns during that span en route to 37 receptions for 540 yards and two touchdowns, making him a must-start option if he's deemed ready to go Sunday against the Packers. Golladay (chest) came down with just six of 15 targets for 58 yards in Sunday's 27-9 loss to the Vikings. Analysis: Golladay has been the only functional piece in Detroit's passing game for a while now, and even he's having trouble getting much going with the shell of Matthew Stafford (back) struggling under center. The volume should be there for the second-year wide receiver in Week 17, but don't count on Golladay ending his five-game touchdown drought when the Lions travel to Green Bay. Golladay (chest) is listed as active Sunday against the Vikings, Tim Twentyman of the Lions' official site reports. Analysis: In the wake of a career-high 146-yard performance last Sunday against the Bills' top-ranked pass defense, Golladay was limited in practice all week by a chest injury. Nevertheless, he'll be available against a slightly less staunch Minnesota defense through the air that contained him to a 3-46-0 line on four targets Week 9. Golladay (chest), who is listed as questionable for Sunday's game against the Vikings, is expected to play, a source told Ian Rapoport of NFL Network. Analysis: Golladay's status will be confirmed when the Lions release their inactive list 90 minutes prior to 1 p.m. EST kickoff, but it looks like fantasy managers planning on using the wideout can bank on him being available. The second-year player is coming off a Week 15 outing against the Bills in which he posted a career-high 146	receiving yards, but Minnesota limited Golladay to three receptions for 46 yards on four targets back in Week 9. Golladay (chest) is listed as questionable for Sunday's game against the Vikings. Golladay (chest) was a limited participant in Thursday's practice. Golladay was listed as a limited participant on Wednesday's practice report with a chest injury. Analysis: Golladay's reps were capped in the first two practices of last week as a result of a quadriceps issue, but he turned in a full session Friday and proceeded to post a career-best 146 receiving yards Sunday in Buffalo. With a different concern this time around, his activity level should still be watched, but it's an encouraging sign that he was on the field in some fashion for the start of Week 16 prep. Golladay caught seven of eight targets for 146 yards in Sunday's 14-13 loss to Buffalo. Analysis: Golladay was the only offensive player able to get going for the Lions, as no other receiver reached the 30-yard mark and no Detroit player got to 50 rushing yards. This performance broke a three-week trend of declining yardage totals, and it gives Golladay 90-plus yards in three of the past five games coming into a Week 16 date with the Vikings. Golladay caught two of four targets for five yards during Sunday's 17-3 victory over Arizona. Golladay (quadriceps) doesn't carry a designation into Sunday's contest at Arizona. Analysis: After having his practice reps capped Wednesday and Thursday due to a quad issue, Golladay didn't miss a single one at Friday's session. 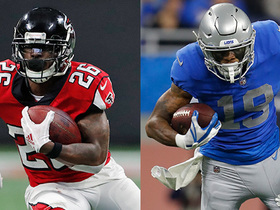 As the Lions' unquestioned top pass catcher in the wake of Marvin Jones' season-ending knee injury, Golladay may be shadowed by Cardinals All-Pro cornerback Patrick Peterson on Sunday. Despite the preceding, Golladay has been targeted 44 times over the last four games, volume that is difficult to discount. Golladay (quadriceps) was limited in practice Thursday. Analysis: After he was estimated as a limited participant Wednesday, Golladay upheld that activity level as the Lions took the practice field one day later. There has been no indication he's in danger of taking a seat Sunday in Arizona, but Friday's injury report will confirm as much. Golladay was a limited practice participant Wednesday due to a quadriceps injury, Dave Birkett of the Detroit Free Press reports. Analysis: Golladay seems to have picked up a minor issue in the process of catching three passes for 50 yards on eight targets in Sunday's 30-16 loss to the Rams. 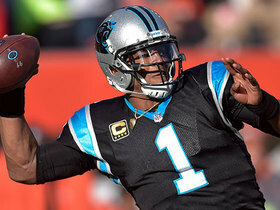 His ability to start Week 14 preparations with a limited practice suggests he's on track to play in the Lions' upcoming game against Arizona. Golladay brought in three of eight targets for 50 yards in the Lions' 30-16 loss to the Rams on Sunday. Analysis: Serving as the most proven receiving threat on the team by far, Golladay saw plenty of defensive attention, which helped lead to a poor catch rate. 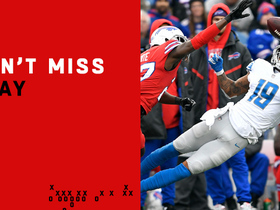 The second-year wideout was able to notch a 24-yard grab that accounted for nearly half of his production, but his receiving yardage tally was his lowest over the last four games. Golladay will look to bounce back with a return to his previous production when the Lions tangle with the Cardinals in Week 14. 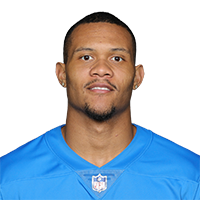 Golladay brought in five of eight targets for 90 yards in the Lions' 23-16 loss to the Bears on Thursday. 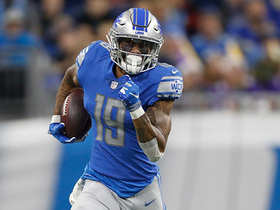 Golladay brought in eight of 14 targets for 113 yards and a touchdown in the Lions' 20-19 win over the Panthers on Sunday. Golladay brought in six of 13 targets for 78 yards and a touchdown in the Lions' 34-22 loss to the Bears on Sunday. Golladay caught three of four targets for 46 yards and rushed once for eight yards in Sunday's 24-9 loss to the Vikings. Analysis: While Golladay exceeded his receiving yardage from each of the past two games, he came up short of his production from the first five weeks. The second-year wide receiver was supposed to see an increased role following the trade of Golden Tate to the Eagles, but the Detroit offense looked dysfunctional in general, as Matthew Stafford threw for only 199 yards while taking 10 sacks. Golladay and the Lions will travel to Chicago in Week 10. 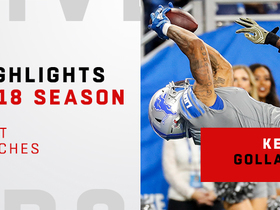 Detroit Lions wide receiver Kenny Golladay's best catches in 2018. 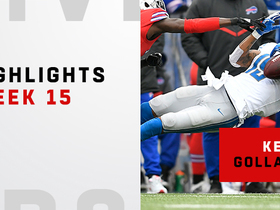 Check out Detroit Lions wide receiver Kenny Golladay's craziest catches vs. Bills in Week 15.